Although we may have some coleslaw at a summer barbecue or serve cabbage soup on the occasional snowy evening, vitamin-packed cabbage rarely gets the attention it deserves. 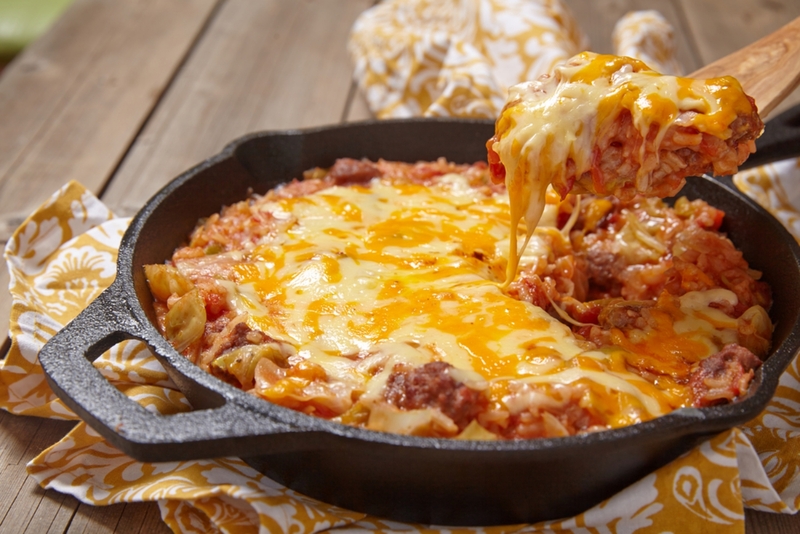 This cheesy casserole recipe sneaks cabbage into a flavorful combination of beef, tomatoes and gooey cheeses for a satisfying dish that will have even cabbage-haters asking for seconds. We loved the hearty texture and comforting flavor, but what we really like about this dish is its simplicity. With just a few basic ingredients and a single skillet, you can have a warm, filling and delicious dinner on the table in less than an hour. Can’t argue with that! Brown ground beef and onion in large skillet over medium-high heat until beef is no longer pink and onions are tender. Season with salt and pepper, drain, and return to pan. Stir in cabbage, diced tomatoes and tomato sauce, and cook over medium heat until cabbage is just tender. Add rice and water, increase heat, and bring mixture to a boil. Reduce heat to medium-low, and cover with a tight-fitting lid. Simmer about 25 minutes without uncovering until rice is tender and most liquid is absorbed. Remove skillet from heat. Sprinkle with cheese. Replace lid, and allow cheese to melt completely.